All our solar materials at The Shade Store block UV Rays and absorb head while still allowing you to keep your beautiful view. 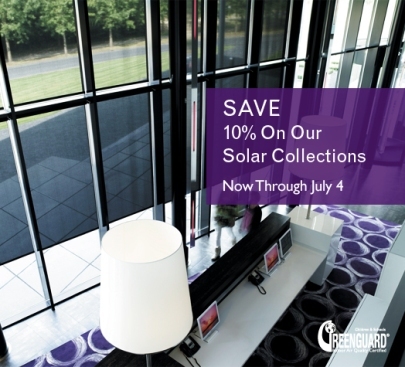 Starting today, all our products with solar materials are 10% off until July 4, 2011. This sale includes our Solar Shades, Solar Roman Shades, Solar XL Vertical Systems, and Solar Panel Systems — all handmade with GreenGuard Certified materials. And now, all our Solar Shades have new designer brackets available. Keep cool and shop now for solar savings.